The conflict between Toronto’s cabbies and Uber is coming to a head, with some taxi drivers threatening to bring the city to a standstill amid the Pan Am Games if the city doesn’t take action against the ride service. “The taxi industry is on its last legs and if UberX continues the taxi industry will be destroyed,” said Sam Moini, a spokesperson for the Toronto Taxi Alliance, as quoted at the Toronto Sun. He described Uber as a "rogue agency that does whatever it wants." At Toronto City Hall Thursday, some taxi officials threatened to “shut down” the city if Mayor John Tory didn’t crack down on Uber’s UberX service, the Globe and Mail reported. Some even threatened to overturn and burn Uber cars, as protesting taxi drivers did in Paris last week. Moini said some cab drivers have reported income drops of 50 per cent. “We can’t compete with somebody that doesn’t have the same rules as us." Uber counters that it's good for the economy, and estimates it will create the equivalent of 8,000 full-time jobs in Toronto this year. But the taxi industry argues UberX is an illegal taxi service, and Toronto’s municipal government agrees. It has taken Uber to court, seeking a permanent injunction against the service. And despite the city’s legal battle with Uber, Mayor John Tory seems to agree. He said last fall that the ride service “is here to stay” and argued a way should be found to bring Uber within city regulations. But in many cities around the world, the conflict between Uber and taxi drivers is escalating. 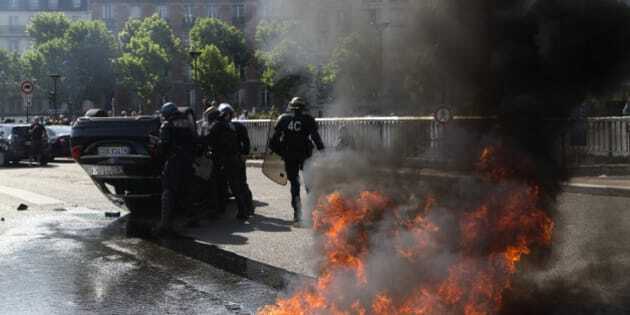 Paris was the site last week of some of the most violent anti-Uber protests yet as taxi drivers set fire to tires on a major arterial route, grinding traffic to a halt. Closer to home, Montreal has seen at least 40 Uber cars seized this year as authorities crack down on the service. A class-action lawsuit on behalf of cabbies was launched in the city last winter. In Toronto, police ran an undercover sting on Uber drivers in March, charging 11 Uber drivers in a three-day period. A court dropped one of the two charges laid against each of the drivers, saying there is no prospect of conviction on the charge of operating a commercial vehicle without proper insurance. The drivers still face a charge of operating a commercial vehicle without a licence. The legal battle between the city and Uber could prove to be protracted. The presiding judge has questioned whether his court is the right venue to settle the matter, suggesting new laws need to be written. And he has predicted that, whatever he rules, the decision is likely to be appealed.